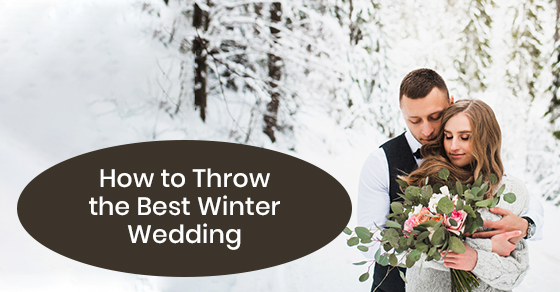 Many couples get caught up in the whole summer idea for weddings and miss out on some perfect opportunities to create a truly magical winter wedding. Weather aside, there is a lot you can do to create a truly breathtaking event that will set you apart from the other weddings of the year. From unique fashions for the wedding party to creating a cozy romantic reception, winter weddings are something out of the ordinary that guests will love. It’s also the perfect excuse to head south for your honeymoon when the cold winter winds are howling. Here are our top ideas to help you create an inspired winter wedding. Your winter venue will have to be indoors. That is a given. However, once you find the ideal venue, it will provide the perfect backdrop for an endless list of wedding themes. Winter is stunning with its ice, snow and evergreens. You can book around the holidays such as Christmas, New Year’s or Valentine’s Day or go completely rogue with any old day between December and March. This is off-season so you will have your pick of dates and might even be able to get a venue you might not otherwise be able to afford. When choosing a winter venue, however, a cheerful fireplace is a must to welcome guests. Winter offers a whole new world of wedding themes. As mentioned, you can go for a holiday wedding, but you might find your guests are less available on these key dates. Instead, you can look to off days when people are available, and prices are right. You can create a winter wonderland using the reflective qualities of ice and snow as an inspiration to create stunning lighting. This is the time of year to take full advantage of twinkling fairy lights and the soft flickering effects of candles. These details help set a tone for winter weddings and can be used with lighting and less Christmassy evergreen intertwined and wrapped around pillars and latticework. Every serving table should be adorned with crystal and candelabras. You can also look at snowflakes for inspiration to add a touch of elegance when paired with delicate lighting. Other wintry décor ideas include more rustic looks with pine and pine cones or more elegant greenery such as mistletoe and holly. If this is not a holiday wedding avoid colour combinations of red and green and instead choose white or cream or green on green. Elegant navy blue can work well for winter weddings, or for more casual looks pretty powdery blues. Bare branches either in their natural state, or painted white or silver can be used to add height and interest to floral arrangements. They can be decorated with sparkling lights and crystal snowflakes for a shimmery touch of winter beauty. Have your wedding cake reflect the season with delicate white on white designs shimmering with pearly touches. You can also add rustic touches such as pine cones or whimsical snowflakes. Winter weddings allow you to choose far more elaborate fashions incorporating elegant touches such as arm length gloves, delicate bolero jackets, mink stoles or elegant velvet shawls. You can also look for large white muffs in fur or satin for the bride and bride’s maids. Unique choices in footwear such as pretty little satin boots with a Victorian buttoned look, or something sexier such as open-toed white leather boots are perfect for winter brides. Winter calls for a change in headpieces and can even include elegant fur hats complete with veils or sparkling headpieces. For the groom, you can explore different wintry textures such as an elegant luxe tweed or a fancy black velvet. Winter is all about texture and warmth, with wool and cashmere offering interesting overcoat ideas. It’s also the perfect season to consider vests for a touch of warmth and class. Warming layers are a must for the entire wedding party if you are planning to take outdoor photos. Keep in mind you can rent fur items such as coats and stoles if you are not averse to wearing fur that is! Welcome guests to your reception with a warm cocktail such as a hot toddy, spiked coffee, hot chocolate or mulled wine and cider. You can also include warm and cozy appetizers like unexpected warm soup shooters. If you want to do something different think of winter friendly comfort foods such as an elegant pot roast with Yorkshire pudding or roasted veal with rosemary roasted potatoes. Although we mentioned that holiday weddings can sometimes prove difficult to schedule with guests, there is a flipside to that view. A holiday wedding provides a perfect opportunity for guests who are travelling to spend time with family and friends at this important time of year. More people also have taken time off from work which might encourage them to attend. However, as we already mentioned there is a downside to holiday weddings, not just because you might have trouble getting people to attend, but also because this can be a difficult time to travel. From blizzards to more expensive flights, some people might not be too keen on the whole winter travel idea. Weather permitting, what could be more romantic than arriving in a horse-drawn sleigh? This is an idyllic way to take advantage of your wintry setting. You can also have fun with your wedding favours with something winter appropriate, such as individual packs of hot chocolate and marshmallows, hot apple cider spices or mulled wine packages. Consider having warm blankets at the church that people can place over their shoulders or laps as larger churches tend to get chilly in the winter, especially if people are opening the doors often. Make sure you have a coat check service ready so people have somewhere to put their winter garb. People might even want to change from boots to shoes if the weather is particularly snowy. Consider having just one venue for your ceremony and reception so you can reduce the need for travel in inclement weather. A winter wedding can be magical with the right planning. If you would like to talk more about planning your winter wedding click here to speak to the Chateau Le Jardin team.